Kate and Oli: Focus On...MsBelle And A Giveaway! I don't wear makeup, I rarely do my nails, I hardly ever brush my hair. But I wear jewelry. I love big, chunky stones, and delicate filigree; brightly colored gemstones and oxidized metal; the way my wrists look with bracelets on and jingle they make when I write or walk. I tend to wear simple clothes and jewelry is my statement maker. Am I feeling fierce? Did I have a rough morning? My jewelry selections can tell you a lot about my mood. When I came across Ms Belle: Artisan Crafted Jewelry, I was in a happy mood; a fun, cheerful, bright mood. A spring-y mood, because spring starts tomorrow, something I can't wait for! This is why I instantly fell in love with her selection of colorful, wire-wrapped jewelry. The woman behind Ms Belle, Ginger, uses only high-quality materials and her craftsmanship is stunning. She has agreed to answer my silly interview questions and also offered up a spring-y treat for my lucky readers! My name is Ginger Wagner and I live in Charlotte, NC. I’m married and have a young son as well a spoiled rotten rescue dachshund named Barney. In my jewelry I mainly use precious metals, high quality gemstones, and freshwater pearls. I try to use the best quality materials I can as that’s what I want in my own jewelry. Wire wrapping is my favorite technique. It’s lots of fun and becomes almost a Zen thing for me sometimes. 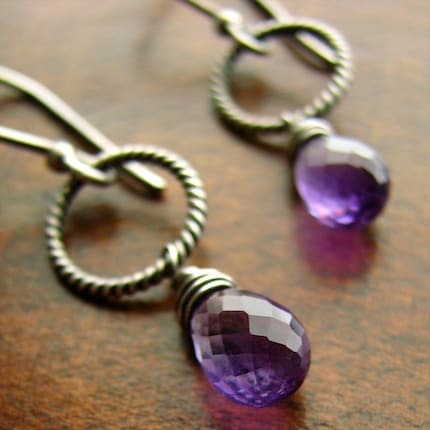 Plus, I really love the look and feel of wire wrapped jewelry. Someday I would like to learn metalsmithing too. When I first began making jewelry in the late 1990s, I made it for friends and family. Later on I discovered some selling venues online, one of which was Etsy. I kept coming back to it and was fascinated by their approach. I finally decided to open MsBelle in 2006. I’m glad I did. I’ve met so many wonderful and talented people from all over the world, many of whom I now consider friends. Ideas come from everywhere. Sometimes ideas are born from nature: trees, flowers, the sunset. They all provide inspiration. Other times ideas come from a combination of stones lying next to each other on my workspace. Customers sometimes inspire ideas too. Perhaps their idea for a custom piece will open the door to an entirely new way of looking at things, inspiring a whole new concept or a totally different piece. So my inspiration can come from many sources. I usually like it quiet when I make jewelry. If anything, I will listen to NPR on the radio. More often than not, music becomes a distraction to me though. Hmmm. I’ve really never thought about that before. Maybe a hummingbird. I’d love to know how it feels to be able to fly like that! It would have to be a Rubellite tourmaline necklace I wire wrapped in solid 14k gold. The stones are such a gorgeous quality and color. I used 14k gold as the metal because I just felt like the stones deserved it! Pioneer Woman, Dew on the Kudzu, and Shutter Sisters. Ms Belle has chosen a fantastic necklace as a prize for one lucky winner!! This piece will instantly add spring to your wardrobe! The necklace is a AAA quality, green amethyst, faceted teardrop briolette measuring 15x8mm. All metal used is 14k goldfill. The length is approx. 19 3/4 inches and it closes with a trigger clasp accented by corrugated goldfill beads. This necklace is a $58 value! Ms Belle will gladly customize the length for the winner. Head over to Ms Belle and choose your favorite item. Come back here and leave a comment with your selection. 1. Become a Facebook fan of Ms Belle. 2. Follow the Ms Belle blog. 4. Add my button to your blog (you can find it in the left hand sidebar). 5. What piece of jewelry do you always or never wear? Fine print: Giveaway begins when it is posted and ends at 11:59pm pacific standard time March 25, 2010. A winner will be selected by a random number generator on the morning of March 26, 2010 and will be emailed promptly. Ms Belle will ship anywhere in the world! My favourite is the Smooth Labradorite Briolette Necklace in Oxidized Sterling - Carley, although I'd also love to get the Soft Aqua Chalcedony Briolette Earrings in Sterling Silver - Misti! I always have rings and earrings on !! I (almost) always wear the medic alert tag I made in a jewellery class 10 years ago, its copper sandwiched between sheets of silver, with the little snake and staff and the words cut out. The copper used to be red, but over time its turned black. I only take it off for special occasions requiring special jewellery! I never wear rings: much as I like them, they're usually uncomfortable on my chubby fingers. I always wear my sterling silver celtic knot ring that my parents got me a few years ago. Love it! I adore Ginger and I'm a big fan of her work! My current fave is the Carley necklace - the labradorite is just gorgeous. I looooove the smooth labradorite necklace and earrings, and also the prehnite teardrop briolette earrings. it's so hard to choose just one! I am ALWAYS wearing a ring my mom gave me. She got it when she was a teenager at some gift shop by the Grand Canyon. My heart just melts for the "Smooth Labradorite Briolette Earrings in Oxidized Sterling Silver", love the color & shape but it's really more like "love at first sight!" The one piece of jewelry I always wear and never take of is my wedding band and engagement ring, love them both and what they mean to me! The Cranberry Peral Linear earrings in Sterling Silver really caught my eyes! 1&2&3. I'm already a fan of the MsBelle Facebook page and follow her blog and on twitter. 5. I never wear my wedding ring. It gets in the way. Such a lovely shop! i love the Soft Aqua Chalcedony Briolette Earrings in Sterling Silver!! lovely! I always wear earrings! I only wear my wedding ring when I leave the house! i follow Ms Belle's blog! Love the Cranberry Pearl and Mystic Blue Quartz Rondelle Necklace in Sterling Silver - Lola. I love Rose Quartz Briolette and Oxidized Sterling Silver Earrings - Blackened Roses. I love the 'Walk in the Woods Necklace'. Great giveaway! I adore the smooth labradorite briolette necklace in oxidized sterling- carley. I now follow MsBelle's blog. I never leave the house without a bracelet on my wrist! Such gorgeous jewellery! I love the Faceted Prasiolite (Green Amethyst) Briolette Solitaire Necklace-Bethany. 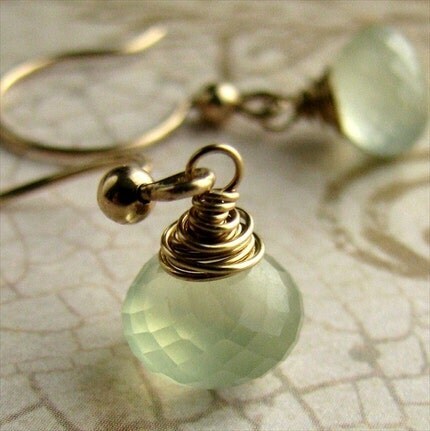 I love the Soft Aqua Chalcedony Briolette Earrings. My favorite item in Ms Belle's shop is the twirly earrings. I love the Pink Amethyst Briolette Solitaire Necklace in Goldfill - Pamela, and the giveaway necklace too! Thank you for this gorgeous giveaway! What a great shop! I love the Soft Aqua Chalcedony Briolette Earrings in Sterling Silver - Misti. Gorgeous!!! I always wear silver earrings. My favorite is the Soft Blue Chalcedony Polished Briolette Necklace in Sterling Silver - Denise. I have a couple of bracelets made from natural stones which I have worn only a couple of times, simply because they aren't comfortable to wear for work, too casual for dates and parties, and I usually forget to wear jewelry when I go out for shopping or something. 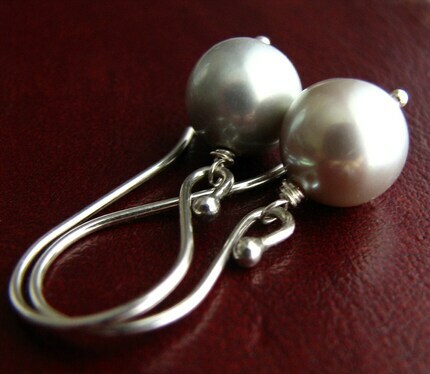 I am a google follower and love the cranberry pearl earrings in sterling silver. Although it is hard to choose a favorite in this shop! I never wear a watch anymore - I took it off when the battery ran out several years ago, and haven't missed it! 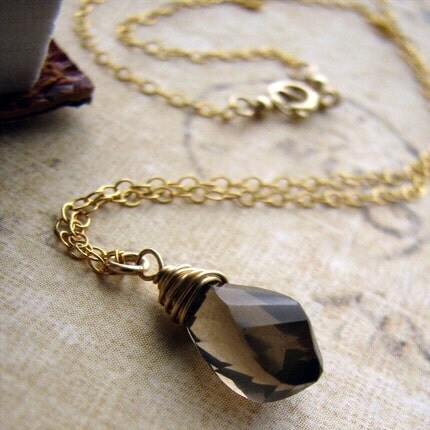 I Love the Lemon Topaz Faceted Cube necklace! Just beautiful! I also love that giveaway necklace! Would love to win it! Thanks for the chance! I always wear a silver necklace with a little bird charm that my best friend gave me this past Christmas. It's simple but sooo "me". I love anything with a bird, nest, or egg theme and I wear this necklace all the time now. It's so special to me. I'm a Facebook fan of Ms Belle. I Follow the Ms Belle blog. I'm now a follower of the MsBelle blog. The piece of jewelry I almost always wear are some dangly labradorite earrings. Just posted about this on my facbook, too. 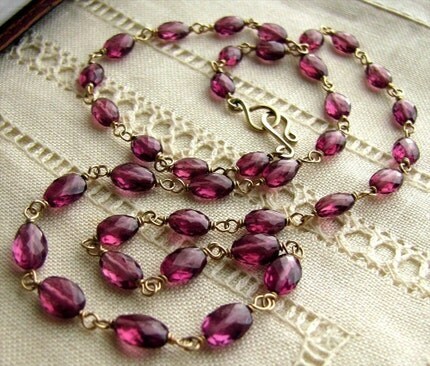 I love the AAA Rubellite Tourmaline Necklace in Solid 14K Gold - Darlis. I always wear my wedding band. I love the Smooth Labradorite Briolette Earrings in Oxidized Sterling Silver. I never wear rings. I can never find ones that fit properly. Beautiful, I follow the blog! I really like Pink Mystic Topaz Briolette and Textured Disc Necklace in Sterling....but a close second is the Cranberry Pearl Rondelle necklace. I always wear my engraved wedding ring. Tweeted - RT @ichbinseins giveaway alert! win a gorgeous green amethyst necklace from MsBelle! 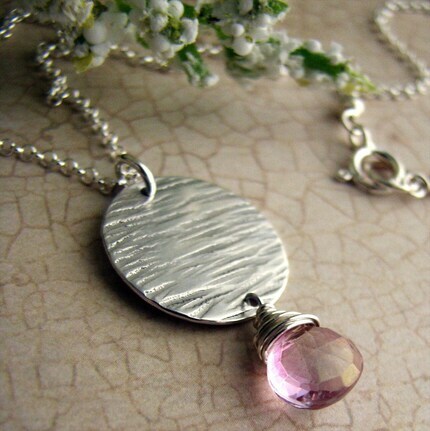 I love the Pink Mystic Topaz Briolette and Textured Disc Necklace in Sterling - Josie! I always wear either my diamonds or pearls on my ears and try to mix it up with a fun necklace or bracelet! I like the Blue Topaz Briolette and Filigree Earrings in Oxidized Sterling Silver - Trisha. I always wear my hazelwood and hematite necklace. I love the Solid 18k Yellow Gold Hammered Hoop Earrings. This very necklace that can be won is my favorite! I love the light green color. I like the earrings too! i love the AAA Citrine Briolette Solitaire Necklace in Oxidized Sterling - Loren. i never wear bracelets - too much trouble! Wow!! Your jewelry is gorgeous. 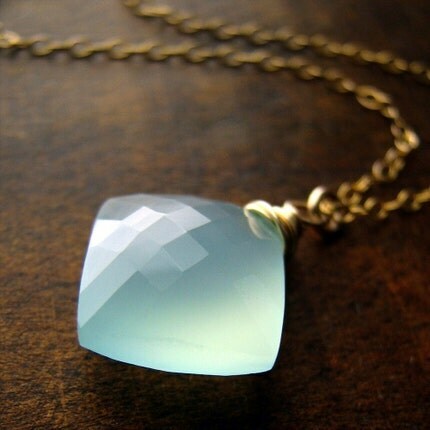 I love the Aqua Chalcedony Puffed Diamond Briolette Necklace in Goldfill! My favorite item(s) would be the Mystic Green Amethyst Briolette Earrings in Goldfill - Allyson. They just happen to match the necklace in the giveaway. I became a fan of Ms Belle on facebook. I follow Ms Belle's blog. I always wear my wedding ring. I like Carved Citrine Necklace in Sterling Silver-Darlena. I love the Mystic Green Amethyst Briolette Earrings in Goldfill - Allyson . I follow Ms. Belle's blog. so different and so beautiful! Beautiful shop- i esp love the Prehnite Teardrop Briolette Earrings in Sterling. I am a Facebook fan of Ms Belle! I become a Facebook fan of Ms Belle. What piece of jewelry do you always or never wear? I always wear pretty, simple jewelry. I don't wear heavy, chain-like jewelry. The AAA Rubellite Tourmaline Necklace in Solid 14K Gold - Darlis is stunning! I always wear my wedding and engagement rings and a sapphire and diamond band ring. I never wear a cloisonne necklace which was given to me because it doesn't fit well and is not really my style. My favourite piece is the Loren - a Citrine Briolette Solitaire Necklace in Oxidized Sterling. Such a gorgeous colour with the light coming through it and I love silver, especially with an oxidised or antique finish. My favorite item is the Cranberry Pearl and Mystic Blue Quartz Rondelle Necklace in Sterling Silver - Lola. Very pretty. Wow, what beauties. It was hard to pick just one. I liked the AAA Citrine Briolette Solitaire Necklace in Oxidized Sterling - Loren. Became a Facebook fan of Ms Belle. Follow the Ms Belle blog. I loved the custom piece on her blog. I always wear my engagement ring. I love the AAA Pink Mystic Topaz Faceted Cube Earrings in Goldfill. I'm following the Ms Belle Blog on Google Friend. I never wear a necklace...I would if I had I one I really loved. I just haven't found that special one yet. I always wear a ring and earrings. I love the mystic green amethyst earings. I am now a happy follower of Ms Belle's blog. I twittered the contest with the link you provided! I never leave the house without earrings or I feel naked! I'm an earring addict in fact. I never wear bracelets however, they just don't work for me. I have a charm bracelet that I always wear; it has a picture of my father on it. I can't help it, blue is my colour and the Sky Blue Topaz Briolette Solitaire Necklace in Sterling Silver - Angela is pretty awesome. I like the Smooth Labradorite Briolette Necklace in Oxidized Sterling - Carley. My favorite item is the Aqua Chalcedony Puffed Diamond Briolette Necklace in Goldfill. I am a follower, and love the AAA Citrine Briolette Solitare Necklace. Thanks! My favorite item is the Blue Topaz Briolette and Filigree Earrings in Oxidized Sterling Silver - Trisha. I'm a FB fan of Ms. Belle. I always wear my wedding ring. Other than that, I try to always wear earrings. I like pins, but rarely wear one. I really like the Pink Amethyst Briolette Solitaire Necklace in Goldfill - Pamela. But all her jewelry is gorgeous! I would love to own any of those pieces!! i ABSOLUTELY LOVE AAA Citrine Briolette Solitaire Necklace in Oxidized Sterling - Loren ! My favorite item is th Cranberry Pearl and Mystic Blue Quartz Rondelle Necklace in Sterling Silver - Lola. I like the Citrine Briolette Solitaire Necklace in Oxidized Sterling. I'm a white gold girl so I like the play of the yellow stone with the silver. I always wear my wedding ring and my 30th birthday necklace. One of my favorites is the Sky Blue Topaz Briolette Solitaire Necklace in Sterling Silver - Angela. I absolutely love the Smooth Labradorite Briolette Necklace in Oxidized Sterling - Carley! I always wear two simple silver band rings on my right hand.